It’s Shamrock Shuffle weekend in Chicagoland, and even though I’m not running it, I do work at a running store so I have been hearing all about it this week. All of this buzz about the Shamrock Shuffle got my running coach brain going and I decided that I should write a training plan for those of you who want to run the 8K next year or for those of you who have another upcoming 8K or 5 mile race. Today I’m sharing my 8K and 5 Mile Training Plan for Beginners, and will be sharing an intermediate plan tomorrow! Disclaimer: Always consult your doctor before starting any exercise. This is meant to be a general guideline for training. Always listen to your body and if something doesn’t feel right, talk with your running coach or your doctor. Run smart and don’t get injured! Weekly runs: Since this is a plan for beginners, you should be running all of the weekly mileage at a conversational pace. What is conversational pace? It’s a pace that’s slow enough that you could talk to someone if you were running with them. Running with a buddy makes this easy, but if you’re not training with anyone, try talking or singing a line to yourself every once in a while. Just think of the fun looks you’ll get from other runners! XT: Cross train to add strength and cardiovascular fitness. Depending on where you are in your fitness journey, you can leave Wednesday as a rest day or cross train. Another great way to cross train is yoga. 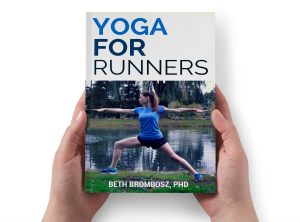 Yoga has so many benefits for runners and it will really help you have the best race possible. 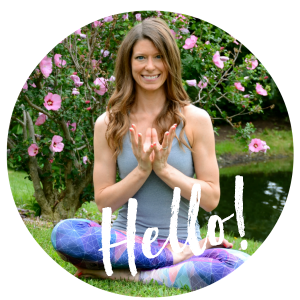 If you’re looking to get started, check out my yoga for runners section and maybe try out my Post-Run Yoga Sequence or my Quick Seated Hip-Opening Yoga Sequence for Runners. Optional speed work: If you think you want to work on getting a little faster, try throwing in some strides after your runs on Tuesdays. To run a stride, you start by jogging, gradually increase to just under a sprinting speed, hold for a second or two, and then gradually slow down. You should cover about 100 m or yards total in each stride. Start with 6 strides in a row if you’ve never tried them and gradually work up to sets of 8 or 10 strides. Want more speedwork advice? Read my Speedwork for Beginners post. Have you ever run an 8K or 5 mile race? What’s your favorite themed race? I’ve never imagined running more than 5 miles, so this program would be perfect for me, whenever I decided to do an 8K race!! Thank you! great way to get the word out about your products. Perth Party Hire for the perfect arrangements and many other benefits also.